The other day I was walking through our home renovation and hit me how many design decisions are coming my way. Some mad pinning and Instagram scrolling later... And here I am. I've narrowed down my top inspiration to some key elements I want to bring into my home decor plan from the kitchen to the bathrooms. The kitchen walls started going up this week and oh my god it has been amazing to see the spaces come to life after talking about them for so long!! After putting together this design plan a while back, I am getting a lot of inspiration from this kitchen. It has nearly an identical floor plan AND the stove and microwave / oven on the same wall yet still manages to feel open and airy. I am lobbying to bring this into the new kitchen. It feels classic and natural for our house and can possibly make the space feel more bright. Corner cabinets almost always feel awkward and I am looking for a way to give the kitchen a more open feeling. Forgoing the corner cabinet for the uppers and just running the cabinets all the way to the side wall on the back feels like good solution. Plus, I love the look of this glass hutch. 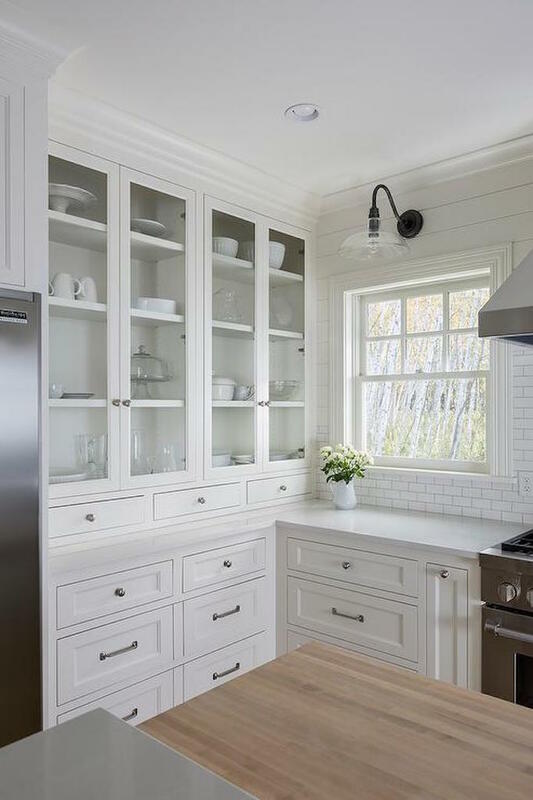 This kitchen is absolutely stunning for some many reasons...I love the depth the blue cabinets bring into the space. Now onto the bathroom. 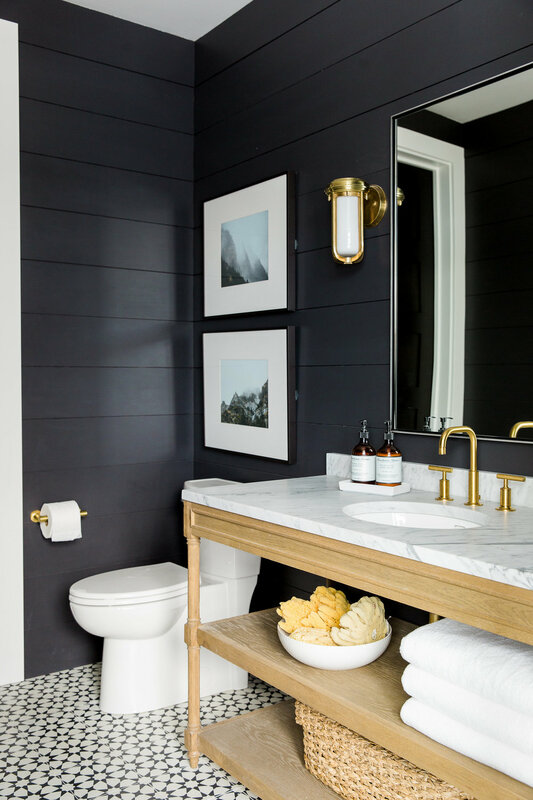 There will be a new bathroom added to the first floor that can be used as the powder room and as a guest bath (catch up on the floorplan here). I am thinking about a weathered washstand in this space with baskets on the shelves to provide towel storage. Fingers crossed space allows for it. In the guest room that will likely be used as an office at the get-go, we have some wooden bookshelves that came with the house. I have always wanted to make a statement in this room and keep thinking about painting these bad boys a deep blue. Going to the upstairs, you may have seen the update on my Instagram last week that we had to demo our retro bathroom. We hadn't planned on doing this from the start, but after opening up the ceiling in the kitchen we needed to repair the wood structure underneath the floor. Here's a look at our old bathroom. For the new bathroom, I want to keep with classic white tile but am thinking about a muted but tiled patterned floor. This bathroom will ultimately be shared by two of the bedroom upstairs so I am also trying to ditch the pedestal sink for some counter space. In the master bath, the tub will be the focal point under a double window. Obsessing over this look with the curtains and rug. That's all for this week! Check back next Wednesday where I'll be sharing our next update of what's happening in our home reno.